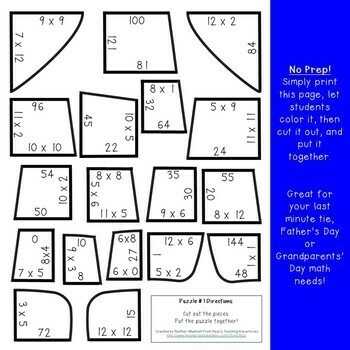 These Father's Day Math Activity Puzzles make it quick and easy for teachers to provide hands on games that meet the needs of all students. Use them to create a fun Father's Day tie card or craft with an academic emphasis! They work great as activities, centers, stations, or games. With a no prep option - these are the perfect last minute resource for your 3rd, 4th, or 5th grade students! 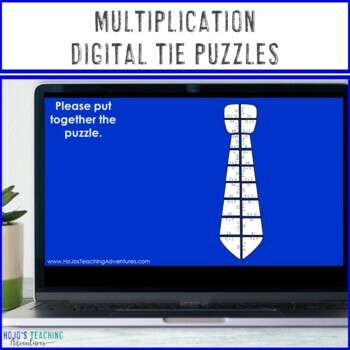 WANT TO MAKE YOUR OWN TIE PUZZLE ON ANY TOPIC? 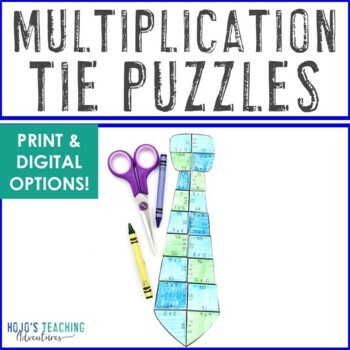 Check out this EDITABLE Tie Puzzle now! If you want a multiplicat ion puzzle you can use at ANY time of year, check out this Multiplication Magic Square Puzzle . There are three puzzles included in this download. Plus you also get a NO PREP option of each of those puzzles. This means there are 6 total puzzle options! Choose which option works best for your students. The no prep puzzles are a great option if you want students to get some fine motor cutting practice and NOT know the final shape. 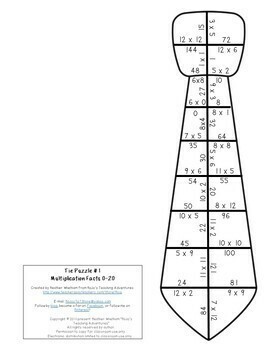 These “cut out” sheets are meant to be given directly to the students to cut out and put together so they don't know the shape. These will be more challenging. But they are no prep – just print and go! An editable PowerPoint file has been included as a center rubric. A full page option and half page option are both included. Print these out for immediate use, or change the wording and format to fit the needs of YOUR students. Use these puzzles anytime you need a fun math activity - particularly for Father's Day or Grandparent's Day. Students with special needs also do well with these once they understand the concept. With this fun game format your students will stay engaged while practicing necessary multiplication skills! These puzzles are meant to be somewhat of a challenge - which is perfect to promote a growth mindset. Students will have to keep in mind the shape of the tie and persevere if the task seems challenging. Tell students to rotate the pieces around and analyze what they can do differently until they fit. This is where their critical thinking and 21st Century skills will come into play! Homeschool Families: You're going to love these puzzles as a last minute, print and go resource! The next time you have a crazy hectic home school day - grab, download, and go! You'll instantly get your sanity back, fit in some academic work, AND have fun at the same time. Answer key included! Correcting is easy when you use the original fully formed tie to ensure all the numbers are in the correct order and the shape is fully created.